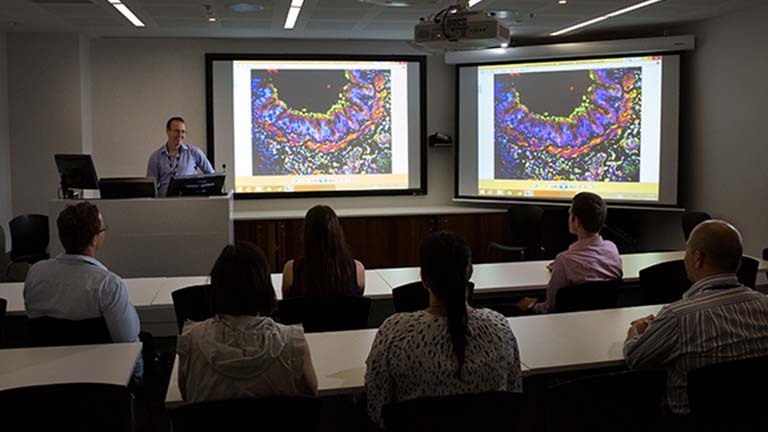 Hunter Medical Research Institute offers a suite of services and resources to assist affiliated researchers and their research. Bioinformatics & Special Applications Support offer services from big data analysis to high-performance and cloud computing platforms consulting, configuration, management and setup. Clinical Research Design and Statistics Support Unit aims to provide comprehensive epidemiological and statistical support to biomedical researchers. The state-of-the-art HMRI Clinical Trials Support Unit (CTSU) is located in the HMRI Building. The area allows researchers to conduct clinical trials with an unprecedented ability to achieve accurate study results and track research outcomes. The Health Research Economics (HRE) group has been established to foster the integration of economic principles and techniques into health research, build regional capacity and expertise in health research economics and to conduct original research of relevance to the field of health economics. The HRE team aims to be an internationally respected centre in health economics that promotes efficient, equitable and affordable health care by focusing on translational research. Offering a range of services from Wi-Fi access to database design and management, the HMRI IT Services Unit offers all medical researchers and PhD students free initial consultations to discuss your grant proposal or project requirements. HMRI can assist in recruiting partcipants for research studies through the HMRI Research Register as well obtaining media coverage and promoting studies through the website and social media platforms.